Question: “Hi Jerry, Great to see you at the koala rally on Wednesday. Our next plan is to try and have a meeting with the developers. We were wondering if you might be able to help us with an alternative landscape plan to present. Cheers, Sandy R”. Answer: Dear Sandy, six years ago I interviewed Deborah Tabard OAM, a Brisbane- based gardener and CEO of the Australian Koala Foundation, for a gardening story. If land proposed for redevelopment is known to be koala habitat, development must put the koalas first. The koala was listed as ‘vulnerable’ in May 2012. The koala joins many other threatened species protected by the federal Environment Protection and Biodiversity Conservation Act 1999 (EPBC Act). At the time of the listing, the Australian Koala Foundation said “it is a victory for Queensland and New South Wales”. But foundation CEO Deborah Tabart said “the protection does not go far enough and the Federal Government has underestimated the danger koalas face”. If you’re passionate about koalas you’ll do anything to help their survival. In 2008, I met a Queenslander who has made them her life work, starting with a koala friendly garden in Brisbane. Deborah Tabart OAM practices what she preaches – to live and garden sustainably and keep pets on a koala-friendly property. Deborah’s search for a new home ended when she set her eyes on ‘Illawarra’, two hectares of trees and turf, situated in the rolling hills of Brookfield in western Brisbane. That was twenty five years ago, when the nearby road was dirt, there were fewer cars, and suburbia was further away. Back then, koalas had similar pressures to live with as now, although their plight was less intense. Like all good gardeners Deborah could envisage how she could improve her plot to suit her mission, but what she didn’t realise was how long it would take to repair the land and make it koala-friendly. The soil was an unpreposessing loamy shale, heavily compacted, eroded and starved of organic matter. The site was very exposed, but it had a framework of remnant eucalypts. It had potential koala habitat stamped on it. In an instant Deborah decided Illawarra was the place to put down roots. Deborah’s first steps were to fix salvaged hollow logs and nesting boxes to trees for marsupials and microbats to improve the site’s overall habitability for wildlife. Then she planted fruit and nut trees and vines to guarantee that food would “fall to the ground” for Ben, Sam, Lara and Alison, her four children. Now as then, there were weeds everywhere, but the weed types have changed. First to go were the environmental weeds like lantana, because they can act as wicks for flames, allowing minor grassfires to reach into trees, causing significant crown fires. Gone too are heavy climbing weeds, like madeira vine, which can kill mature eucalypts simply by ripping off their branches. Such weeds no longer threaten Illawarra, so Deborah now fosusses on remaining nuisance weeds growing at ground level. Deborah patiently applies permaculture techniques. Illawarra is chemical-free. 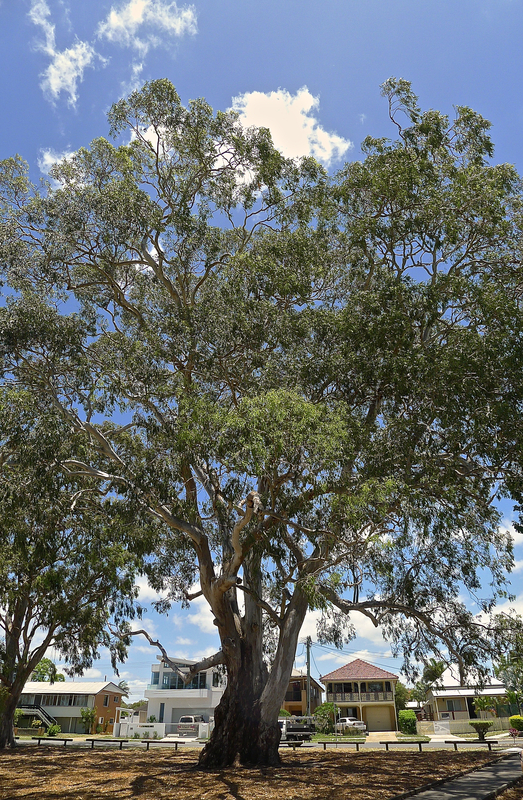 Ongoing drought has claimed the life of a mature eucalypt. Full of nesting hollows, it’s still working as a habitat tree. 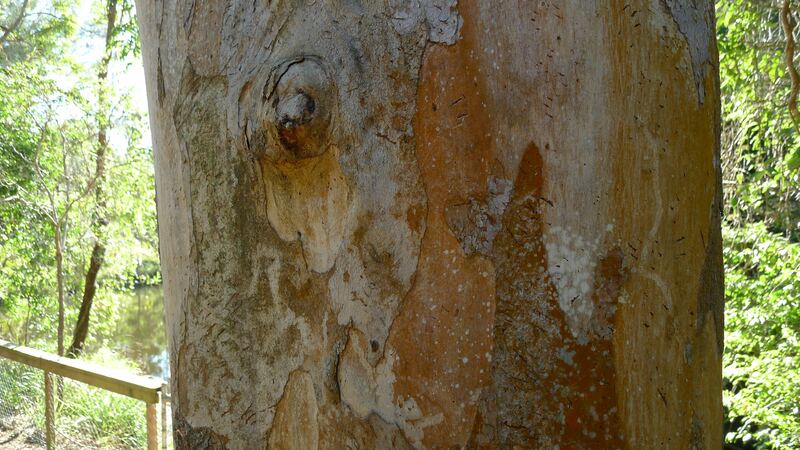 “It’s so important to protect old trees – it can take a lifetime for them to develop hollows”, saya Deborah. Exactly how do you get rid of mature camphor laurels without herbicides? “By using nature’s tools – plant a strangler fig in the top”, Deborah answers, “My aim is to live in the real world, and to live as sustainably as I can”, she says, pointing to regenerating eucalypts and wattles emerging robustly from the undestorey and the now disused tennis court. Wattles are favourite plantings because they feed so many creatures. Apart from being quick, easy, fragrant and attractive plants to grow, their roots fix nitrogen, they attract insects and produce masses of seeds, both of which provide food for birds and other animals. There are other great rewards too. No comparable property in the district has so many microbats living in it. Deborah believes this is not because they lack habitat elsewhere, but because Illawarra has both habitat and food – millions of insects – her legacy of twenty five poison-free years of gardening. White cockatoos, black cockatoos, flying foxes (Australia’s most important pollinator), barking owls and powerful owls (Australia’s largest owl), all frequent Illawarra for one simple reason. Koala habitat is also their habitat. The battle for balance, as Deborah puts it, is now tipping her way. “It took many years to understand how the site, the soil and its plants, native and exotic, collectively function. Then suddenly things started falling into place”. Organic matter is accumulating, and you can feel it underfoot: the leaf litter layer puts a bounce in your step. Geese and chickens convert weeds and curl grubs into fertiliser, eggs and meat, and there are compost heaps and mini-vegie gardens dotted around in sunny gaps in the canopy. “I buy native plants from local creek catchment regenerators. I only plant after useful rain and plants are watered once. Then they’re on their own”, says Deborah, “With little effort, I can guarantee getting a meal every day from the garden”. From early childhood, Deborah was immersed in family of animal lovers and gardeners. Devoted to animal rescue, at any one time her family would have 30 – 40 cats and dogs awaiting new ‘forever’ homes. Deborah enjoyed helping and, gaining medical training, determined to follow her parents’ footsteps. In 1988 Deborah joined the fledgling koala sanctuary and, as their new CEO, determined to find funds for scientific research. That was when she identified the lack of habitat maps necessary for long term conservation planning. Twenty years on, the Australian Koala Foundation has bloomed into an internationally recognised scientific organisation. The Koala Habitat Atlas, produced by Deborah and her team of scientists and volunteers, has so far mapped a staggering four million hectares of land, creating one of the largest works of conservation research for any species in the world. In 2008, Deborah was awarded an Order of Australia Medal for her inspirational and tireless efforts to protect koalas and their natural habitat. What are the elements of a koala-friendly garden? Koala populations are fragmented across a vast swathe of eastern Australia, but they always live amongst eucalypt forest. Cohabiting with koalas live four hundred other threatened species. Deborah believes that if the koala is secure, so are these other species. Importantly, eighty per cent of koalas live on private property, so how we live and garden can have a significant and positive influence on conservation generally. Koalas specialise in feeding on eucalypt leaves and also use a range of tree species for resting and shelter. Occasionally they’ll nibble bottlebrush, teatree, large species of wattle and paperbark (especially cajeput, Melaleuca leucadendron, one of the two most important habitat tree species in SE Qld). Forest red gum, Eucalyptus tereticornis. 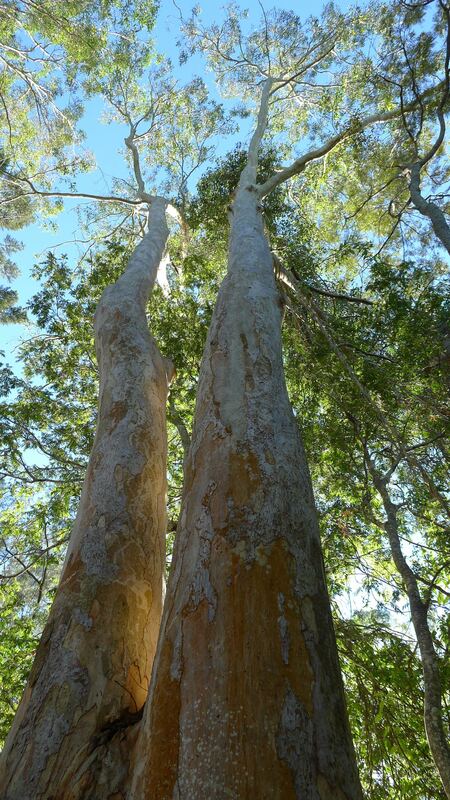 This is one of the two most important habitat tree species in SE Qld. All of these trees grow best when sown as seed or planted as seedlings, and the best provenance is wild source – grow koala forest with wild genes! So the next question is, where can I buy stock? At the time I interviewed Deborah (2008) it was possible to buy the widest range of koala forest tree species from the community nursery at Kumbartcho Sanctuary and Nursery at Eton’s Hill or the Greening Australia Nursery at The Gap. Sadly, Greening Australia closed their nursery at The Gap in November 2014. In many areas, gardens are now interwoven with koala habitat. Despite being arboreal, koalas frequently walk from tree to tree, crossing roads and gardens. This is risky, because even the gentlest of dogs feel threatened by their first koala encounter and will defend their territory. 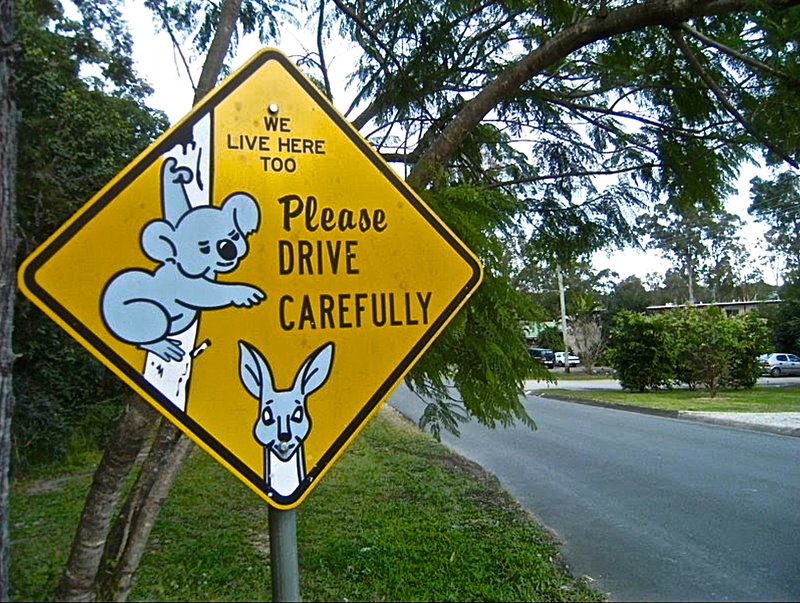 In certain circumstances it’s possible to keep cats and dogs and stay koala-friendly. Koalas are most active from dusk to dawn (or on very grey, cloudy days), during which time Deborah advises cats and dogs be restrained. Her two Siamese cats, Bob and Beau, have free range within the house and have their own outdoor sun lounge. This is enclosed with mesh for the simple reason that cats cannot be trained not to hunt. The Australian Koala Foundation has never supported banning cats and dogs from existing suburbs, they do endorse their exclusion from new developments built in significant koala habitat. Responsible pet ownership like this means that co-existence is possible. Deborah’s three golden retrievers, Dane, Tim and Polly, were trained as puppies not to chase, however, in the garden they are always supervised. If koala losses do not cease, the koala could disappear from Queensland by 2023, so September has become ‘Save the Koala Month’, when the Koala Foundation joins with Girl Guides Australia to raise community awareness and funds for long term conservation. The most sobering aspect to all this is that cohabiting with koalas live four hundred other threatened Australian species. By securing a future for the koala, a charismatic cornerstone species, many other threatened species, including our native forests, will also thrive. Investing in a future for koalas really is an investment for all. 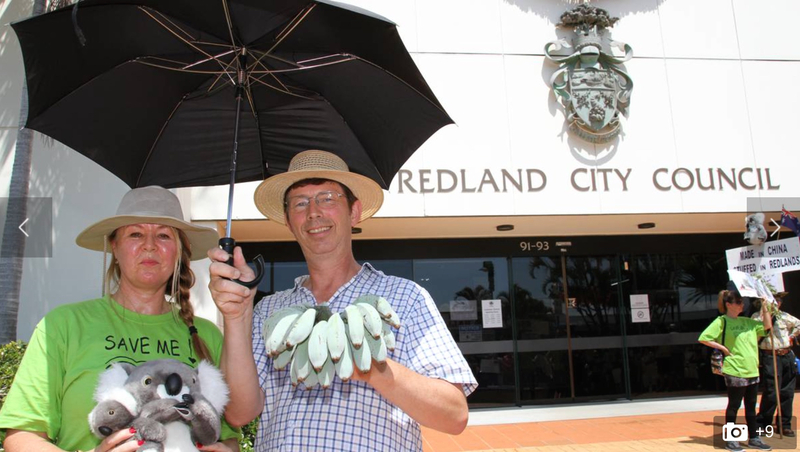 I attended a pro-koala rally ‘Koalas, Made in China, Stuffed in Redlands‘ attended by residents of Redlands Shire Council on 10th December 2014. In the Redland City Bulletin, Kerr reckoned I “joked that koalas would soon have to shelter under umbrellas”. I encouraged people to mock officials (“take the piss out of them“) and to mock their fig leaf of a pro-koala development policy. Why? Because they’re used to people being angry with them for not giving the majority of Queenslanders what they want: to live with koalas. People really want to live with koalas, not to eliminate them. It is unbelievable that Redlands City Council can propose felling koala habitat for development and plant a few seedlings somewhere else to ‘offset’ their loss. I personally have witnessed that it takes twenty years to convert degraded pasture into viable koala habitat. A colleague of mine started that process almost thirty years ago in the Northern Rivers of NSW. Twenty years after planting the right species in open, weed-filled, neglected pasture, he found himself living amongst koalas in planted koala habitat. Children who plant koala forest today could be living in koala habitat in 2034. Damaged habitat can be repaired and extended. Planting Koala Forest is a form of Direct Action Against Global Warming, this supports the Australian Government’s initiative to directly reduce Greenhouse Emissions. Australia’s hardwood forests are also the most carbon dense types of wild forest on our planet. Our forests out perform 132 other old-growth hardwood forest types, including the Amazon, Borneo and the Congo Basin! Preserving Australian old-growth forest is crucial to direct action against Global Warming because our forests, which include species the koala (and the even more endangered Ledbeater’s Possum in Victoria) depend on, grow fast and decay slowly, sequestering huge amounts of carbon dioxide. Afforestation by planting native forest is a form of Carbon Farming, it significantly supports this federal initiative whilst supporting conservation. We already know that koalas flock to forestry plantations, they are extraordinarily appealing to koalas. The single act of conserving existing koala forest and planting more koala forest will sequester measurable volumes of atmospheric carbon dioxide, for which landowners could be rewarded. The Australian National University has done the research and they can even assist managers and economists in assessing ‘value for money’ of projects which integrate forest use, wildlife conservation and ecologically sustainability. More and better managed koala forest offers a cascade of additional benefits, since another four hundred of Australia’s threatened animals and plants also need koala forest to avoid extinction. Thrifty managers of conservation programmes would do well to stimulate interest in pro-active koala conservation. Why fund and resource four hundred individual species recovery programmes when just one species needs to recover? Direct resources to save the koala reduces ‘red tape’ in the form of masses of paperwork and physical conservation of four hundred individual threatened species to focus on just one, the koala. This strategic change has ‘win/win’ and ‘value for money’ stamped all over it! But it still takes twenty years for seedling eucalypts to grow into viable shelter and food trees for koalas. If you cut down a koala tree where does it eat, where does it live in the meantime? Most koalas that are relocated away from building sites in viable habitat don’t survive. They die. Since Mayor Williams supports this nonsensical fig-leaf of a policy, I invited her to quit living in her home and to stop buying food for twenty years, using instead the umbrella and bunch bananas I had brought for her to ‘offset’ her changed living and feeding circumstances. I ended by saying I’ll make a date to see her in 2034 to see if she has coped as well as Redlands’ koalas. Read the article “Koala tree rally calls for land donation“ as (loosely) interpreted by Judith Kerr, Redlands City Bulletin, 10.12.14. Koalas live here. See the claw marks? I love your article. I’m the secretary of Team Koala in the Tweed Valley (just across the border). We are currently supporting the science review board who are petitioning the NSW gov to change the status of the Tweed Coast to critically endangered. I was wondering if I could have your permission to use your article for our members? Sure. Go for it. And good luck! Inspiring story to revisit thanks Jerry. Love Deborah’s passion. My Living and Gardening with Koalas blog is now updated with extra hyperlinks for further reading. That was a great story! Deborah’s work is very inspiring, and so obviously driven by a passion encompassing her whole life.